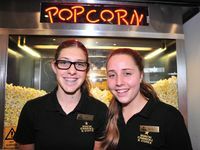 MOVIES are as much a part of Boxing Day as the Sydney to Hobart yacht race and post-Christmas, if the numbers flocking to Sunshine Coast cinemas yesterday were anything to go by. 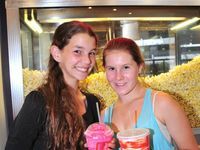 The number of tickets sold by Birch, Carroll and Coyle, Maroochydore, by 10am yesterday had already surpassed the all-day total for Boxing Day last year. "Last year was about 3000, and we've already sold 4000 and it's only 10am," assistant manager Michael Wright said. The big drawcard seemed to be The Hobbit, An Unexpected Journey, the prequel to The Lord of the Rings trilogy. Enthusiastic fans even dressed in costume for the big screen interpretation of J.R.R. Tolkien's novel, which tells the story of young Bilbo Baggins, Gandalf the Grey, and warrior Dwarf Thorin Oakenshield, and their journey to reclaim the lost Dwarf Kingdom of Erebor. 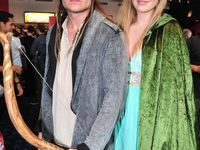 Peter Siggs, who with his sister Amy, arrived in costume, said he had been waiting nine years for the movie. Mr Wright said other new movies included Les Miserables, Wreck-it Ralph, Parental Guidance, and the PG-rated Rise of the Guardians. About 10 extra staff were put on to cope with the expected crowds, but despite the increase in admissions, the queues were not as long in previous years. Mr Wright said a lot of people were taking advantage of online bookings to pre-purchase their tickets, choose their seats, and pay for food and refreshments before they set foot in the door. "I would say, at a guess, about 35-40% are online bookings," he said. The number of admissions was on track to hit between 5500 and 6000 by the end of the day. Despite the numbers, Mr Wright was more than happy to be working at the cinemas yesterday. "I'm actually relatively new to the position. I'm from a retail background. It's definitely calmer than that," he said. What Boxing Day movie release are you most excited to see? This poll ended on 22 January 2013.